A Camping We Will Go…With Our Senses – Marshmallows used for olfactory stimulation and lantern lights to work on visual tracking? Those are just a few of the sensory-based ideas that are part of this camping-themed session plan. Music Therapy + Cognition – Watch this video to see a demonstration of Musical Sensory Orientation Training (MSOT). I’ll be using my clarinet to work on localization skills. 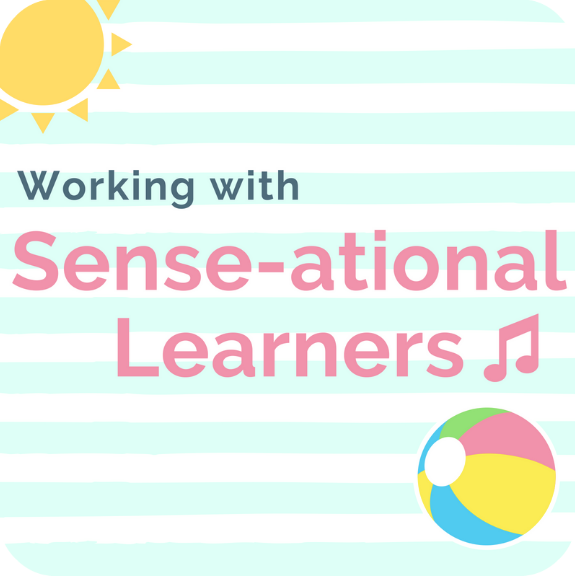 Sense-ational Ideas for Your Music Therapy Sessions – Be inspired with some fresh sensory ideas! So Many Scents – Ideas for incorporating scents into your music therapy sessions to provide olfactory stimulation. Springtime Sounds – Instruments that sound like animals can be used to provide auditory stimulation and prompt localization. Roll the Cabasa – The cabasa is a unique instrument that provides auditory and tactile stimulation. Wind, Wind – An original song to facilitate tactile stimulation using scarves. Have a listen! Halloween is Coming…Are You Ready for Some Sensory Ideas? – Flying ghosts, light up lanterns & pumpkins with cobwebs…read this post to see how I incorporate these items into my sensory-based Halloween sessions. I Like to Go to the Beach ~ A Multisensory Experience – Mangoes to provide olfactory and gustatory stimulation? Sun tan lotion to provide tactile and olfactory stimulation? Yes please! Find out how music ties it all together. The Sights & Smells of Fall – Get a list of Fall sensory experiences that stimulate the nose and ears.